Summer is pretty much over. Let’s have one last peachy hurrah! I have made this cheesecake about 6 times this summer for various birthday’s, special occasions, and parties. It disappeared in record time! 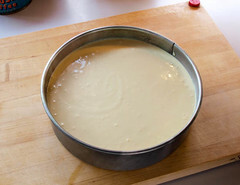 This is a dense, silky cheesecake with a very creamy center. 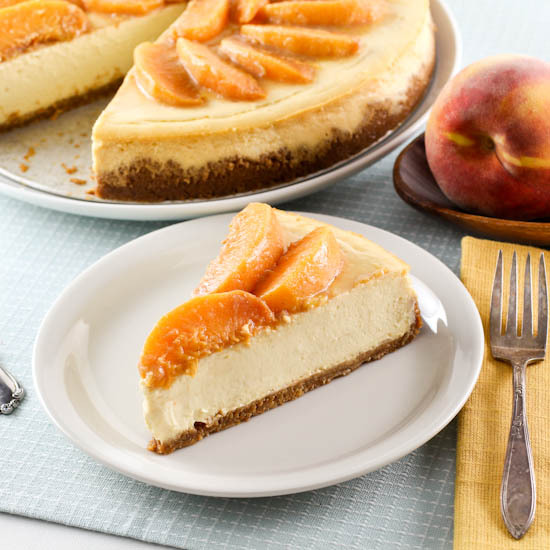 If you love peaches, you will be happy to know peaches are truly the star here, featured on the top and pureed into the filling. This is great after dinner, or as a snack. Hell, I even ate this for breakfast. I have no shame. 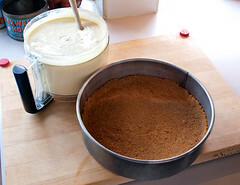 This cheesecake is so incredibly creamy because I use my food processor, not my stand mixer, to make the filling. This reduces the amount of air whipped into the cream cheese, giving it an extra smooth texture. 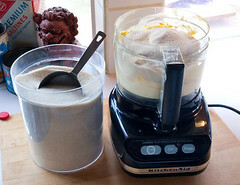 If your food processor is small, or has a low liquid capacity, use it to combine the cream cheese, peach puree, sugar, and cornstarch, then transfer the mixture to a stand mixer with the paddle and mix in the rest. It will not be as creamy, but it will be close. 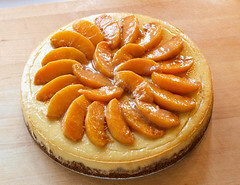 I also want you to use the best peaches available, but don’t use super ripe peaches for the topping. 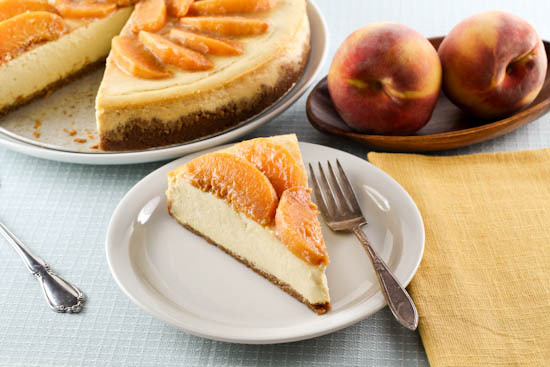 You want a tender peach topping that holds it shape, and ripe peaches will cook into mush. Now, for the filling you can use the ripest peaches you want. 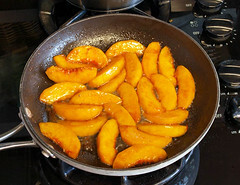 The peaches for the filling are cooked separately from the topping, and are caramelized slightly. That will make them too soft to hold their shape, but they have incredibly deep flavor. And, yes, you an use frozen peaches if that is all you have available. I do not judge. 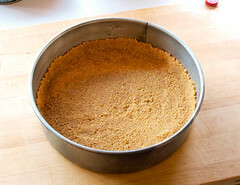 Leave the oven at 350 F. Add a shallow baking dish filled with 1-inch of boiling water to the bottom rack of the oven. In a medium skillet over medium heat add the butter, brown sugar, and cinnamon. Once the butter foams, and the sugar has melted, add the sliced peaches. 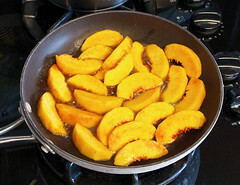 Cook, stirring often, until the peaches have caramelized slightly and are very tender, about 10 minutes. 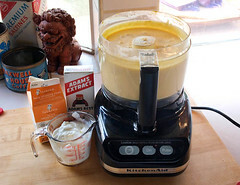 Let the peaches cool for 10 minutes then transfer to a blender and puree until smooth, about 1 minute. 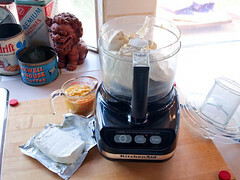 In the work bowl of a food processor add the peach puree and cream cheese. 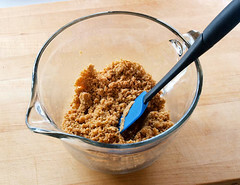 Process until the mixture is very smooth and no lumps remain, about 5 minutes. Next, add the sugar and cornstarch and process for 30 seconds. 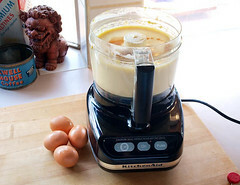 With the food processor running add the eggs, one at a time, processing for 20 seconds after each egg is added. 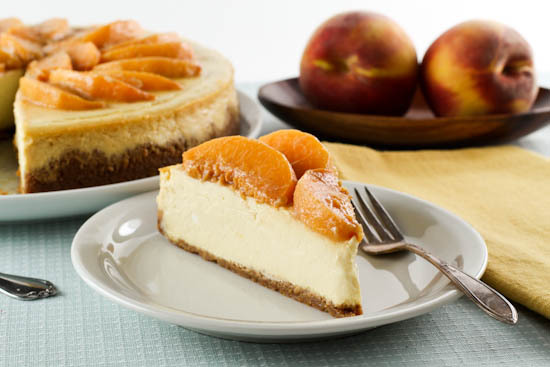 While the cheesecake chills prepare the peach topping. 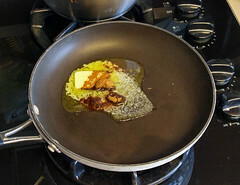 In a medium skillet over medium heat add the butter, brown sugar, and vanilla bean paste. Once the butter foams, and the sugar has melted, add the sliced peaches. Cook, stirring often, until the peaches are just tender, about 5 minutes. 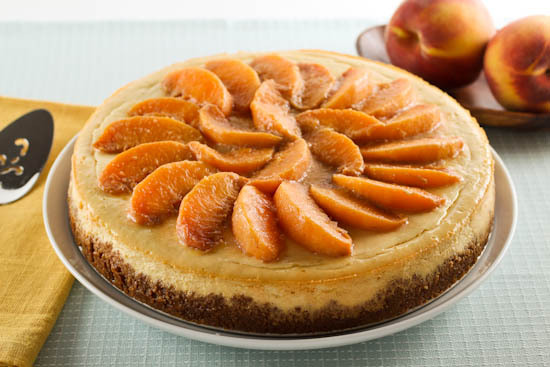 Let the peaches cool completely then arrange on the top of the chilled cheesecake.